We believe the secret to flourishing employees is a culture of consistent, honest, open communication. That’s why we’re thrilled to introduce you to our newest update: 1:1 Meetings. Starting now, you can schedule 1:1s directly in the Small Improvements main navigation window. Define your meeting agenda with Talking Points, and then add Meeting Notes following the 1:1. We’ve made it easy to maintain a clear line of communication throughout your working relationships. That’s because we feel regular meetings are one of the most crucial components of successful performance management. Our lightweight calendar integration helps ensure 1:1s occur with regularity. Each 1:1 Meeting page has its own permanent link that can then be copied into a calendar appointment. We know you feel that way too – integrated 1:1s have been one of the most-requested features. We spent some time working on getting it right, and we’re incredibly excited to share it with you now. Why are 1:1s so important? Let us break it down. First, these (ideally) regular check-ins help you build an ongoing conversation with colleagues and supervisors. A constant rapport means fewer things fall through the cracks, and both parties have a keener insight into one another’s work. Second, 1:1s are an opportunity to validate yourself and share your successes! You can (and should) discuss your career aspirations. It’s a time to let yourself shine when you have your manager’s undivided attention. Third, 1:1s give employees a chance to air concerns before they morph into bigger issues. Conversely, it’s useful for managers to solicit regular feedback from their team members and make the necessary adjustments. In keeping with our design philosophy, everything is presented in our simple yet intuitive layout. The Small Improvements One on One Meeting software builds off our existing features and add texture and depth to the feedback loop, as well as providing a roadmap of where the conversation should go. So let’s get started. Setting up a 1:1 in Small Improvements requires just three simple steps. Schedule a 1:1 Meeting. This is done by clicking on the “1:1 Meetings” on the Small Improvements navigation column. You can then add a link to the page to the other person’s calendar. Set Up Talking Points: These can be se “shared” (both parties can see) or “private” (only visible to the poster). Complete the 1:1 with Meeting Notes: Both sides summarize the 1:1 and align on next steps. Budget for sales team outing on Wannsee (a popular lake near our Berlin HQ). Discussing a personal objective in Q2: improve public-speaking skills. Challenges adjusting back to FT after maternity leave. Setting the agenda gives the 1:1 structure from the start. Plus, Mary can see from Chris’s end that she also would like to discuss personal development goals and could recommend a mentor for Mary to connect with. Following the 1:1, Chris and Mary can then summarize the conversation in Meeting Notes (100% confidential, even to HR admins) so that both understand the 1:1’s key takeaways and next steps. In their next 1:1, both Mary and Chris can easily look at the notes from their previous meeting and see if there are any outstanding themes. 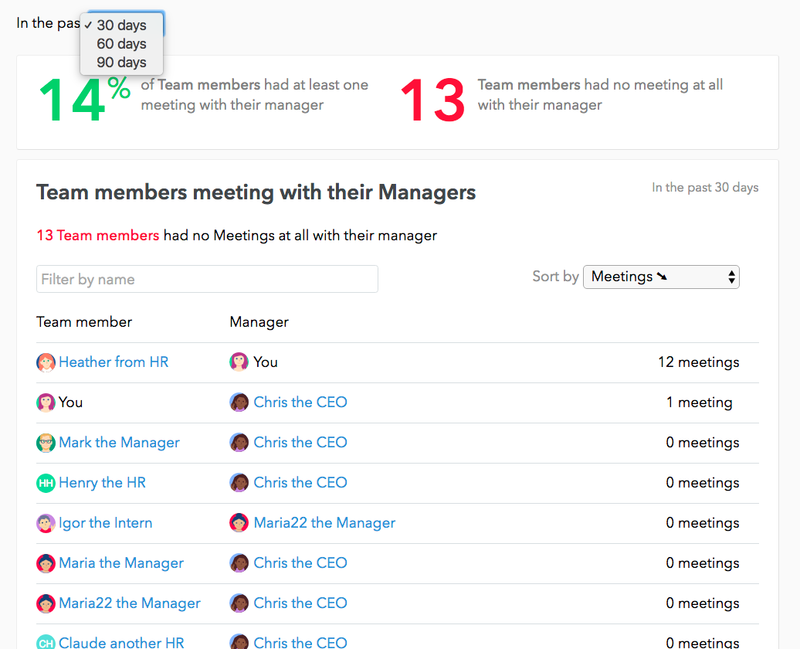 Our Meetings Overview pages help admins keep tabs on 1:1 Meetings in the company. So it’s easy to nudge those who’ve forgotten to set up their weekly 1:1s. Or better yet, praise the ones committed to making personal check-ins a part of their organization’s feedback culture. By syncing your 1:1s with Small Improvements, you’ll not only have more productive meetings; you’ll have a comprehensive record of the next steps you need to take in your personal and professional development. We hope you’ll dive right in by scheduling a 1:1 meeting with someone in your company. Get into the habit of encouraging and requesting feedback – whether it comes from your supervisor, your employee or someone in another department. Have feedback, thoughts, or ideas on how we can grow or improve? Let us know at product@small-improvements.com.